– No change in units of SFPs status. – Robotic surveillances ongoing in Reactor Buildings (Unit 1 and 3). Dose rates very high with mention of up to 57 R/hr (I believe the highest readings were 57 mSv/hr or 5.7 R/hr according to various reports). Robotic surveillance takes video, 02 sampling (for worker habitability), rad levels, temperatures, etc…. Ew TEPCO still evaluating possible entombment of lower basement of Unit 2 reactor building to seal leaks. – Regarding cleanup of water in turbine buildings, it will take Tepco 26 days to pump water to the common rad waste facility building. Tepco believes leakage in one turbine building may come from another unit. Still investigating. – Unit 1 and 2 primary containments drywells are flooded by way of leakage from RPV or recirc pump seals. Believed to be flooded up to lower RPV head and close to core level. Some indirect indications are being used to estimate flood level. Belief is Unit 1 will achieve similar water level by April 27 and that are several feet of water in the lower drywell. – Purging of Unit 2 viewed as not needed at this time because of lack of containment integrity (self venting possibly). 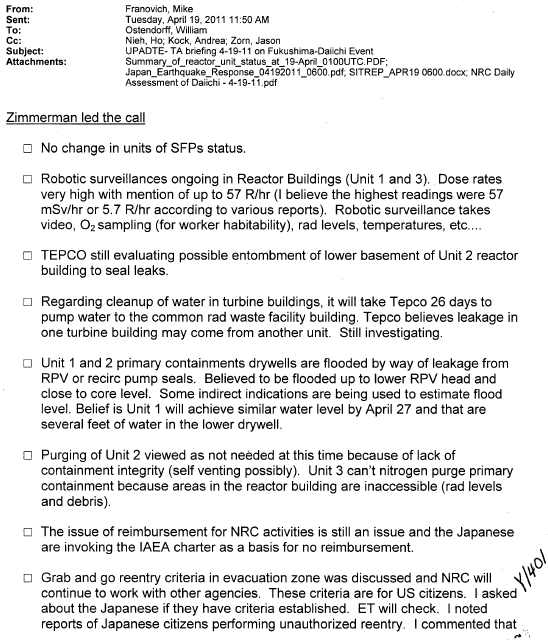 Unit 3 can’t nitrogen purge primary containment because areas in the reactor building are inaccessible (rad levels and debris). – The issue of reimbursement for NRC activities is still an issue and the Japanese are invoking the IAEA charter as a basis for no reimbursement. – Grab and go reentry criteria in evacuation zone was discussed and NRC will continue to work with other agencies. These criteria are for US citizens. I asked about the Japanese if they have criteria established. ET will check. I noted reports of Japanese citizens performing unauthorized reentry. I commented thattimeliness of establishing criteria may be an issue if people are reentering irrespective of government advice. Roy indicated the ET is receiving similar feedback from other Federal partners. – Requested a copy of the NRC’s consolidated comments on the TEPCO Roadmap to Restoration document. – Latest IAEA and DOE reports are attached. Also attached a new arrival called the “Daily Assessment” report that the staff generates.